First impression, "what have we booked? 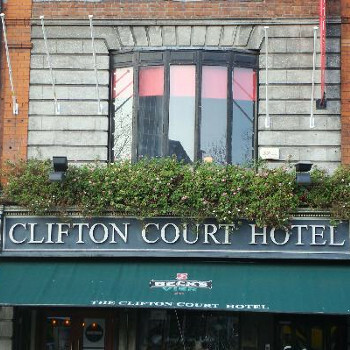 I spent time prior to our break away looking through the websites to find a comfortable hotel in the middle of Dublin. I Found Clifton Courts details and it looked ideal, especially the price. However, never judge a book by its cover! The only way I can describe our room is by calling it an attic, we were at the dizzy heights (no lift I might add!). The smallest room we`ve ever stayed in with a tiny bathroom. Sitting sideways on a toilet is not my idea of fun! The first morning we went down for breakfast the waitress couldn`t even give us a smile never mind a good morning! No breakfast options given just a full breakfast with a scowl. From then on we went to a nearby cafe! We were warned away from the nightclub downstairs by the locals, so we just listened from above until the early hours. I was very disappointed with the hotel and showed no similarity to the pictures advertising the hotel. They shouldn`t be allowed to show such false information. Stayed in the Clifton Court in 2003 and it was fine , so decided to book it again for a myself and group of friends going in April this year.....big mistake!!!! It seemed as if it was a different hotel!!! There was 7 of us going and 2 were travelling later in the day, when we arrived they gave us one triple room with a double bed, and a double room I asked for one with 3 singles and was told there was none, I specifically asked for 3 singles at time of booking, because I had stayed here before in a triple with 3 singles, anyway had to share double bed with my friend,!!! When our other friends arrived at 7pm there was no room at all!!! They got shunted around 4 different hotels, before they got a room, the Clifton court told them to get a taxi to all these different hotels and no one was even expecting them!!! It was a total nightmare it was 11pm on the Friday night before we all got out, also we had booked together and wanted to stay together, they ended up in A hotel about 10 mins walk away.